Hey there pussycat. Janet Beckers here with your Cool Cats video tip of the week. Today I’m looking at one of the other big mistakes that I see business owners make when they’re implementing video and that is so over complicating things. I’m going to show you how do you keep it simple. A lot of times when people go to create video as an integral part of their marketing and their business, they think, right, I’ve got to get an expensive camera, I’ve got to somehow set up a studio or hire a studio so we get the professional look, I’ve got to go and get really, really fancy lighting, I want to get a green screen behind me so that we can make a really interesting background, and, and, and, all these things. It’s way too complicated. I tell you what. You can create really, really professional videos for your business and you probably have absolutely everything that you need. If you’ve got a telephone, got a mobile phone, you’ve got the camera, that’s all that you’re going to need. If you’ve got some sunlight coming through a window, you’ve got your lighting done. If you can get close enough to the camera, your sound is fine. I’m not using any mics today. You do not need to have a proper studio set up. At the moment, I’m sitting cross legged on a lounge. For the first few years I created most of my videos sitting cross legged on the floor with the camera on my coffee table, on a pile of books, I didn’t even have a tripod. You do not have to complicate it. Keep it simple. There are ways to be able to create your surroundings so that it looks professional and it looks as if you’ve got a really fancy studio set up, but you don’t. This is one of the things that we do in our online program and it’s great. I show you behind the scenes of exactly how I’ve set up my studio and I show you past studios for when I set up and how to get the right equipment. The main point that I want to make for you here is keep it simple. You do not need great expense. You can get started honestly without having to spend a single cent more than you’ve already got. There goes your last excuse, okay? You don’t have to complicate it, just get it done. I’d love to hear from you. Just share down below any questions you’ve got, any tips, and if you’d like some help to get started, we’ve got some great training that’s going to be able to help you. 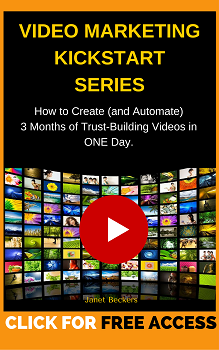 The best place to start’s with our video leverage checklist. It’s going to show you how do you take your videos and then just really, really milk it for all it’s worth and get seen everywhere. There’s links down below that you can click to go and get our help. Otherwise, I’m really looking forward to hearing from you, just leave your comments down below and I’ll come and join the conversation. Bye. I LOVE your branding, Janet! Very “cool” cat! Thanks for all of your free tips. Especially the behind the scenes tips and your links to the right lighting! Very generous of you!